As employers and hiring managers, you know that the hiring process is time-consuming. In fact, on average it takes about 45 days for an employer to find, interview and hire their new employee. When you look at the grand scheme of things, that’s a long time! So when something comes up that can shave some of that time off for you, you would want to know about it, right? If you haven’t heard about it yet, then hopefully we can help you out. Video interviews are helping HR professionals all across the globe shave time off the recruiting and hiring process- starting specifically with the phone screening process. In the interest of saving you time- since time is money after all- let’s take a look at why HR professionals are ditching the phone interview and moving towards one-way video interviews instead. The hiring process for HR professionals and employers has no doubt been grueling as of late. The job market is still very sluggish and one job opening can bring one hundred job applications to your inbox. It takes time to weed through those resumes and find the qualified candidates for your position. Once you have identified those candidates, the traditional hiring process leads you to start setting up phone interviews with those candidates. The phone interview is well known by HR professionals and employers all over. Before you make the move to bring a candidate into the office for an in-person interview, you want to be sure they meet a few guidelines first. That’s understandable. A phone interview is part of the screening process and still deemed very important by employers. However, as an employer or HR professional, you can start to step away from the phone interview and step into the world of video interviews instead. Let’s take a look at why savvy HR professionals are replacing the phone interview in the hiring process with video interviews. Perhaps the most important benefit of video interviews when compared to phone screens is that they save time. On average, it takes an employer 30 minutes to conduct a phone interview with a job seeker. As you know, not all candidates you phone screen will make the cut. That’s the point of the screen in the first place! In fact, how often can you recall having a phone screen with a candidate and realized within two minutes they were not the candidate for you. Did you end the call right then and there, or continue on with the screen for another 20 minutes, wasting your time in the process. On the other hand, the Aberdeen Group recently researched video interviews and found that employers can conduct 10 one-way video interviews in the time it takes to conduct one phone interview (30 minutes). When you can screen 10 candidates with video interviews in the same time it takes to screen one with a phone interview, why not make the switch? 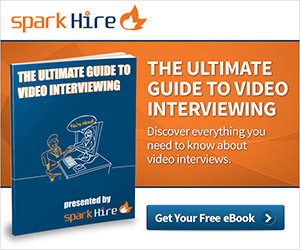 Time is money and the fact of the matter is video interviews save you time. With a video interview, you can instantly see a candidate’s communication skills, personality and body language- all things that are hard to decipher in a phone interview. Most importantly, if you notice a candidate’s video responses are not up-to-par, then you can stop watching the video and move onto the next, saving you tons of time. Phone screens can give you a lot of information on a candidate, true. However, how easy is it for you to compare and contrast phone interviews between candidates? You can easily speak with one candidate on the phone and say, “They’ve got what I need. I’ll bring them in for an interview.” However, it’s likely more difficult for you to compare and contrast candidates based on phone conversations. Unless you are an avid note taker and made great notes on each phone interview, it may be difficult to recall why one candidate was better than another. You are the only employer on the call and the candidate’s qualification rests heavily on your opinion and judgement. When you use one-way video interviews though, you can play one candidate’s answers to your questions and replay it as many times as you like. You see, with one-way video interviews you ask each candidate a series of questions to which they answer in video format. You would ask each candidate to answer the same set of questions so that you can easily compare and contrast their answers against other candidates. This way, it is much easier to decipher which candidate is more qualified and which is simply feeding you generic answers. Comparing and contrasting candidates is important, and deciphering which are the best can really save you time when you decide who you want to bring into the office for an in-person interview. As stated previously, it’s hard to share a phone interview with a coworker or manager of yours. Unless they are in on the phone interview like a phone conference, insight on a candidate by others is gained solely from you. You are the one judging a candidate’s answers and deciphering whether or not they are qualified for the position. Your opinion is subject to a number of different variables: what you deem important, what you want from this potential employee and how you feel at the moment. When you share the phone interview experience you had with a candidate with another coworker or manager, it’s all from your point of view. On the other hand, when you utilize video interviews- and in particular one-way video interviews- you can easily share a candidate’s answers with others. Since candidates are recording their answers and sending them to you in video format, you are free to playback those video responses as you please. You can also show them to your coworkers to gain their opinion. This way, the hiring process is much more comprehensive and the insight of others is easily gained. These are just a few reasons why HR professionals all over are ditching the phone interview and utilizing video interviews. If you can save time, easily compare qualified candidates and openly collaborate with other coworkers all in the screening process, think of how efficient and smooth the hiring process can go for you. If you haven’t tried it out yet, get started on video interviews and start making your hiring process much simpler- and faster.